The area around Moreau Lake was originally a summer home and estate developed by George W. McAdam, a wealthy attorney. The lands were acquired over a 20 year period beginning in 1881. From 1935 to 1940 the area began to develop as a seasonal campground. The natural lake, existing forests and topography offered a scenic area for swimming, camping and other recreational activities. By 1940, the area of the park had been developed with dirt access roads along the southwestern and southeastern areas around Moreau Lake. Between 1940 and 1949, cabins or residences were constructed along the shores of Moreau Lake. In 1961, the State Conservation Department, better known as the Department of Environmental Conservation (DEC), began acquiring land in the town of Moreau under a Bond Act to create a public campsite (Vollmer, 1969). By 1967, approximately 600 acres had been acquired and Moreau Lake State Park was established. This new park was transferred to the Capital District State Park Commission. When the Division of Parks and Recreation was separated from the Conservation Department in 1972, administration of Moreau Lake State Park became the responsibility of the Office of Parks and Recreation, which is now known as the Office of Parks, Recreation and Historic Preservation (OPRHP). Later acquisitions increased the park’s acreage to just under 900 acres. In 1998, New York State acquired over 3,200 acres from the Open Space Institute (OSI) and Niagara Mohawk. The Department of Environmental Conservation acquired the parcels in Warren County that equal 1,320 acres and OPRHP acquired the 1,920 acres within Saratoga County. 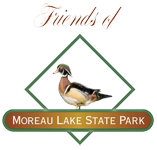 Through a Memorandum of Understanding (MOU) DEC agreed that the 1,320 acres they acquired would be managed and operated by OPRHP as part of Moreau Lake State Park. This more than tripled the size of Moreau Lake State Park. Moreau Lake State Park is now the tenth largest State Park in New York’s park system and the largest park of the Saratoga-Capital District Region.